At Kawasaki, we don’t believe classic looks and high technology need to be mutually exclusive. As a matter of fact, just the opposite. 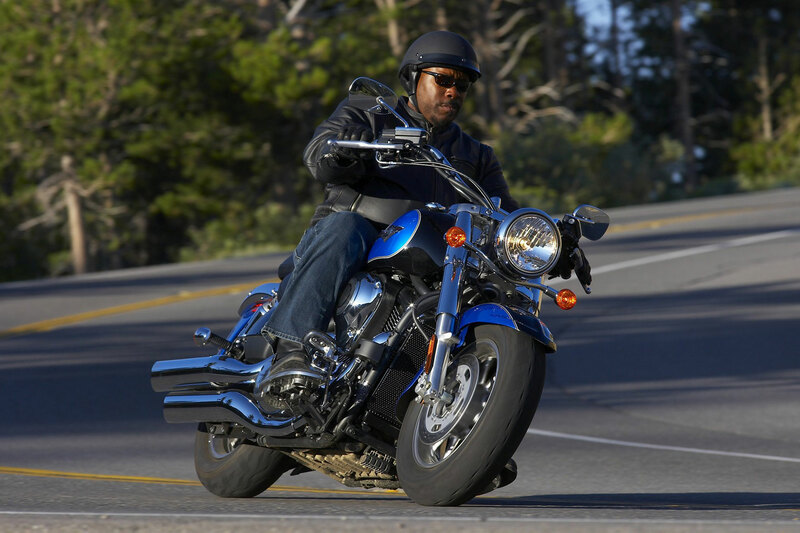 Witness Exhibit A: The Kawasaki Vulcan® 1700 Classic combines things like the latest electronic throttle technology feeding a visceral overhead-cam V-twin, with a dose of old-fashioned cruiser simplicity that lets the rider focus on the experience and not the machine, mile after reliable mile. The Vulcan 1700 Classic V-twin uses a single overhead cam in each cylinder head, rather than a push-rod overhead-valve arrangement, to boost efficiency and provide quick acceleration and superior passing performance. 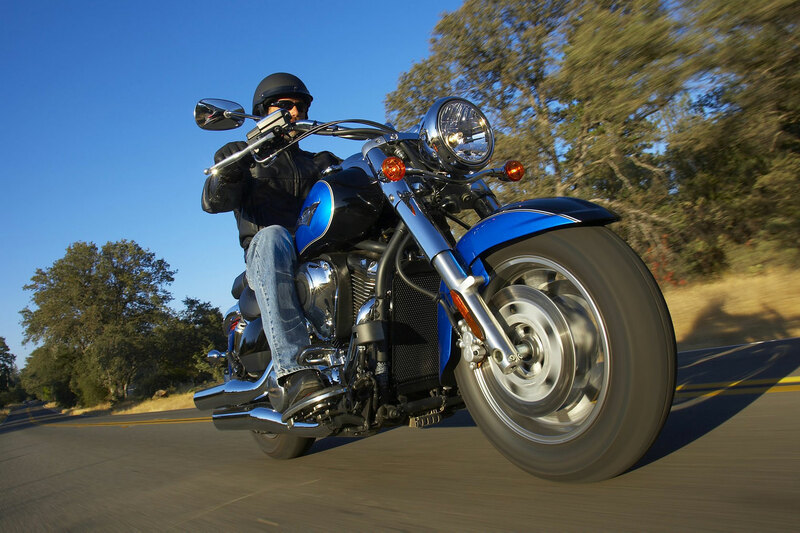 The engine’s long-stroke design, high compression and large displacement produce massive amounts of quick-revving torque, all of it delivered with a distinct V-twin character. Kawasaki’s fully electronic throttle valve system feeds that big V-twin exactly what it needs. Working with a powerful ECU and the rest of the fuel injection system, the electronic throttle valve enhances response without detracting from its distinctive V-twin feel–delivering ultra-precise intake flow to the engine under nearly any conditions. The system utilizes an Accelerator Position Sensor (APS) and a Throttle Position Sensor (TPS). Both units feed data to the ECU, which adjusts the throttle plates to tailor intake airflow accordingly. The system offers a natural throttle feel, because the APS is activated by a throttle body pulley that’s connected by cables to the throttle grip. Like the systems in use on the Ninja® 650R and Vulcan 900 motorcycles, the 1700 Classic’s fuel injection uses one sensor in place of the usual three, for less complexity and weight. Besides the obvious FI advantages like improved fuel economy and automatic adjustment for altitude changes, the system also permits easy hands-off warm-up and idle speed control. This cruising-oriented machine features FI and exhaust system tuning optimized to deliver peak torque at a lower rpm—ideal for urban and back road environments. 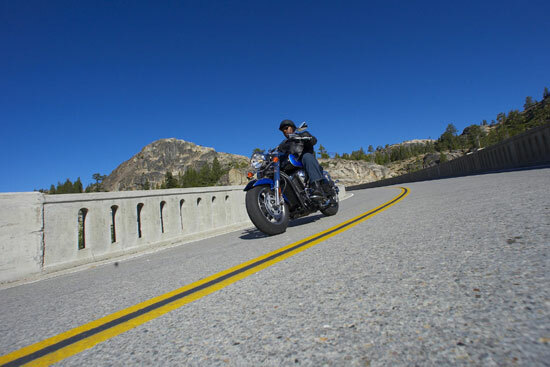 Mated to this rumbling V-twin, a six-speed transmission with overdriven fifth and sixth gears contributes to relaxed riding and better fuel economy at highway speeds. 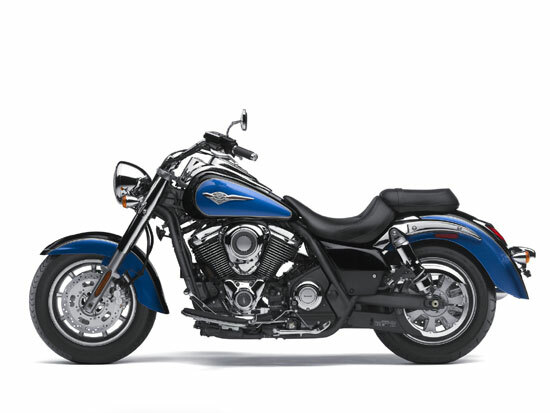 The Vulcan 1700 Classic transfers torque from the transmission to the rear wheel through a thin and light 28mm carbon fiber final drive belt with 40-percent higher tensile strength than a Kevlar unit of the same width. Designed to be as light and slim as possible, the Classic’s single backbone double cradle frame offers a short seat-to-steering head distance, with a correspondingly short wheelbase. 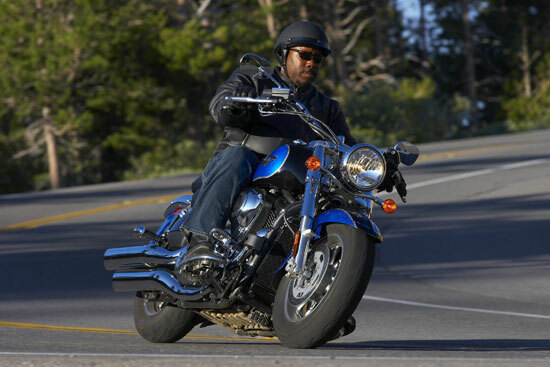 That easy-reach handlebar facilitates slow-speed maneuvering and helps maximize rider confidence. Adding to the light and easy handling are suspension components that match the Vulcan 1700 Classic’s intended usage. An elegantly simple rear swingarm with twin air-assisted shocks provides 3.1 inches of rear suspension travel, and features air spring preload and four-way rebound adjustment. Up front, a large 43mm fork offers precise steering feedback and 5.5 inches of travel. The Vulcan 1700 Classic rolls on nine-spoke cast wheels, which run fat, tubeless tires to complement its muscular styling. A 130/90 front radial and 170/70 rear are mounted on those attractive wheels. Dual 300mm front disc brakes with twin-piston calipers, and a single 300mm rear disc brake with a two-piston caliper help bring this stylish machine to steady, powerful stops. Though it’s packed with technological innovations, the Vulcan 1700 Classic remains a warm, organic machine built for the masses, with all the character, charm and visual appeal riders expect from a Kawasaki V-twin. This rolling showcase of classic cruiser styling not only looks good from any angle, but its elegant form is just as pleasing to the touch as it is to the eye. Authentic Kawasaki Accessories are available through Kawasaki dealers. Newly designed engine is tuned to two performance variations. Both variations (one for touring, one for cruising) offer both significant torque and power gains over their predecessors, as well as superior passing performance. All models feature Kawasaki’s first fully electronic throttle valve system, which together with the fuel injection system offers smooth, natural engine response. Another change from the previous series is the new 6-speed transmission featuring an overdrive gear. 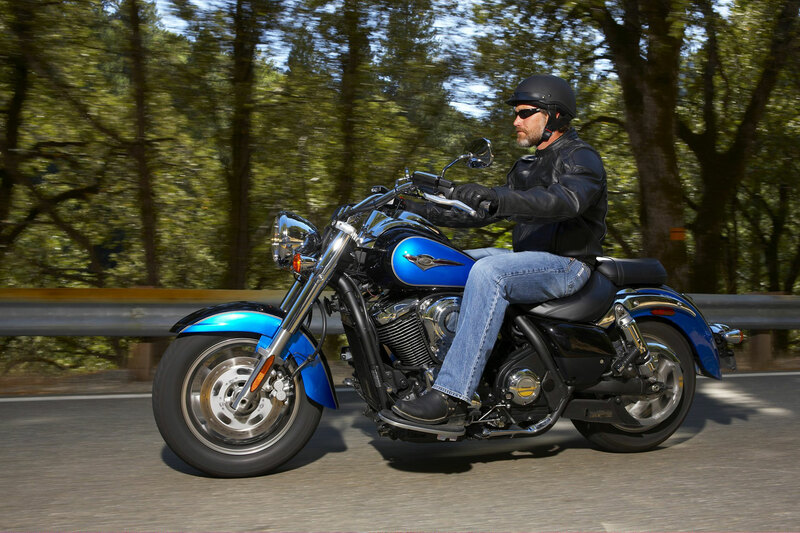 Long-stroke, liquid cooled, SOHC, 8-valve 1,700 cc V-Twin engine was designed to deliver high levels of torque. Bore and stroke measure 102 x 104 mm. Torque is approximately 15% greater than that of the VN1600D. Valve system uses a SOHC arrangement instead of OHV for more direct engine feel and easier merging onto freeways. Large capacity airboxes are located on either side of the engine. Semi-dry sump (like that on the VN2000) allowed the crankshaft to be lowered, enabling a longer stroke without increasing engine height. Both pistons are connected to a single crankpin. Primary balance is satisfied care of two counter-balance shafts. Small-diameter iridium spark plugs reach deep into the combustion chamber for high combustion efficiency, especially at low-load operation (near idling). Belt final drive is quiet and efficient and helps reduce maintenance chores. Using carbon fibre instead of Kevlar as a tensile material, the belt offers high strength (tensile strength is increased by 40%) with a slim size and light weight. Belt width (28 mm) is more comparable to that of the VN900 models (26 mm) than that of the VN2000 (40 mm). Two series of engines were designed for the new VN1700 models: one for the touring-oriented VN1700 Nomad (and VN1700 Voyager), and one for the cruising-oriented VN1700 Classic and VN1700 Classic LT. The difference was achieved through different FI settings and muffler systems. The result is that peak torque (up about 15% from the VN1600 Nomad) and peak horsepower (up about 20% from the VN1600 Nomad) occur at different rpm: cruising-oriented models are tuned such that peak performance occurs at lower rpm. All models feature dual mufflers with the same base construction as those on the VN2000. 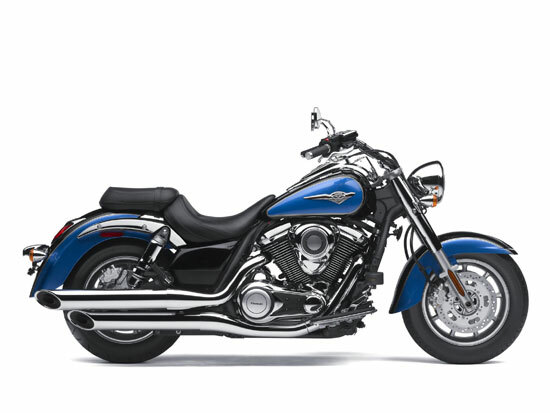 However, the VN1700 Nomad (like the VN1700 Voyager) features twin mufflers (one on each side), where the VN1700 Classic and VN1700 Classic LT feature dual mufflers on the right side of the bike. The clutch on the VN1700 Nomad and VN1700 Voyager models features six damping springs for 3-stage progressive damping that contributes to smoother feeling when getting back on the gas. Engine tuning offers superior acceleration in the 80-113 km/h (50-70 mph) range. Even in overdrive, the engine pulls strongly in this speed range, facilitating overtaking at highway speeds. Kawasaki’s first fully electronic throttle actuation system enables the ECU to control the volume of both the fuel (via fuel injectors) and the air (via throttle valves) delivered to the engine. Ideal fuel injection and throttle valve position results in smooth, natural engine response. Control of both fuel injection and airflow enables precise cold-engine idling speed control. The simple system makes it easy to incorporate other systems, like cruise control (please see below). Twisting the throttle grip actuates a throttle pulley on the throttle body. The Accelerator Position Sensor (APS), also located on the throttle body, sends a signal to the ECU, which then actuates the throttle valves via a DC motor. Throttle position is confirmed to the ECU by Throttle Position Sensor (TPS). Redundancy in the system (APS and TPS each send two sets of signals to the ECU) ensures some control is maintained in case of failure. Because the throttle grip is connected to cables, the feel at the grip is like a standard cable-operated throttle. 6th gear is an overdrive gear, contributing to stress-free riding and better fuel economy when cruising at highway speeds. Operation of the cruise control is conveniently from the right handle. Cruise control can be activated between 47 km/h (30 mph) and 137 km/h (85 mph) in 3rd gear or above. Operating the brake lever, clutch lever or rear brake pedal causes the cruise control to be disengaged. Closing the throttle beyond the “zero-throttle” position is another instinctive way to disengage the cruise control. With VN1700 series models featuring a more compact package than their predecessors, the new frame was designed for light weight and light handling. Designed from the start to be as light and slim as possible, the frame minimises the number of forged parts and trims any unnecessary meat. The only forged parts (the down-tube joint, engine brackets, side-stand bracket, rear fender/shock absorber bracket) are areas that require additional strength. The new frame is lighter than that of the VN1600A, with greater torsional rigidity. More compact in design, the VN1700 has a shorter wheelbase than both the VN2000 and VN1600. The compact design contributes to light handling. Shorter distance between the seat and frame head pipe facilitates handling at low speeds, especially when executing U-turns. Tire choice and suspension settings also contribute to the light handling. The VN1700 Nomad and VN1700 Classic LT add wind protection care of adjustable handlebar-mounted windscreens. Sub-windscreen and deflectors on the VN1700 Nomad further increase wind protection performance. The sub-windscreen covers the area between the windscreen and headlamp when the windscreen is in the raised position. The fork-mounted deflectors help direct air away from the rider’s legs. The VN1700 Nomad features hard, lockable panniers (same as those on the VN1700 Voyager). The top-opening panniers provide 38 litres of sealed storage space for overnight touring. On the VN1700 Classic LT, studded leather saddlebags (like those on the VN900D) offer convenient storage space. Rider and passenger seats differ between the touring-oriented VN1700 Nomad and cruising-oriented VN1700 Classic/Classic LT. The rider seat of the VN1700 Nomad is the same as that on the VN1700 Voyager; passenger seat is also sculpted for greater all-day comfort. Seats on the VN1700 Classic and VN1700 Classic LT are the same except for the studs. Also contributing to passenger comfort, the VN1700 Nomad features a luxury backrest with integrated passenger grab bars. On the VN1700 Classic LT, a studded tombstone-shaped backrest provides passenger back support. As a final contribution to passenger comfort, the VN1700 Nomad features passenger floorboards instead of the footpegs featured on the VN1700 Classic/Classic LT.
Dual adjustable rear air-shocks ensure a comfortable ride feel. Settings are different between the VN1700 Nomad and VN1700 Classic/Classic LT. VN1700 Classic/Classic LT also feature chromed shock covers, contributing the luxurious finish of the rear of the bike. Front and rear guards on the VN1700 Nomad help protect the bike’s engine and panniers in the case of a stationary fall. Convenient helmet locks located on the left- and right-side pannier guards. 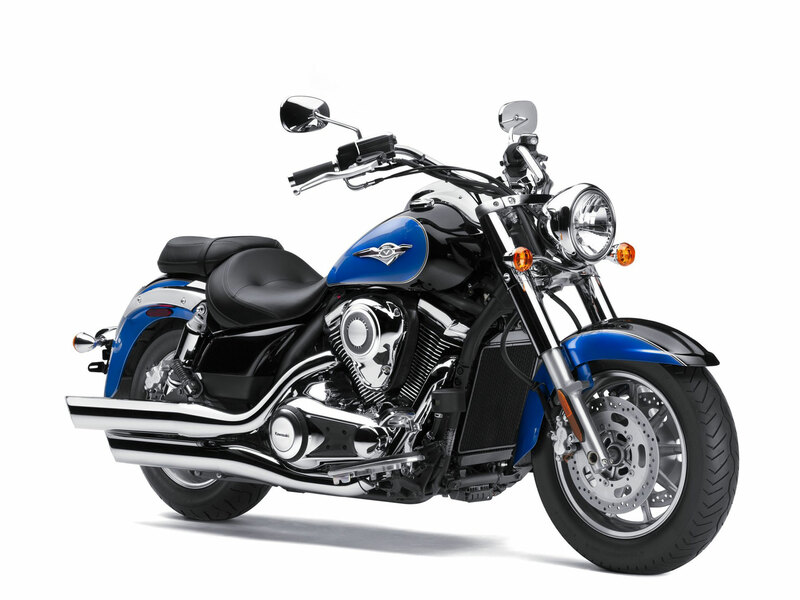 Kawasaki Cruisers have always been a showcase of craftsmanship and attention to detail. The VN1700 series models are no exception. Like on the VN2000 models and VN900 models before them, design of the engine covers and bodywork on the VN1700 models received meticulous care to ensure the bikes not only look good from any angle, but also that their elegant form is as pleasing to the touch as to the eye. 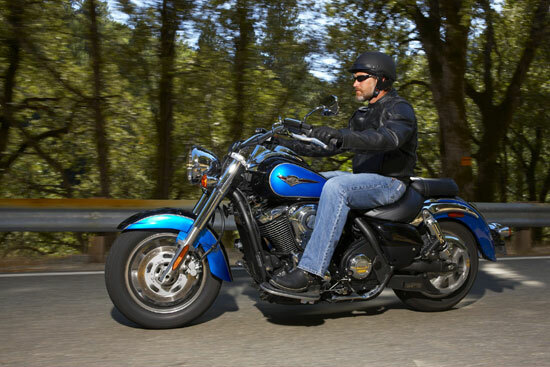 Basic engine structure has a great impact on a V-Twin engine’s appearance. Using a semi-dry sump enabled the engine’s long-stroke configuration without increasing its height. The line created by the top of the airbox and the cylinder heads forms a curved lined that continues to flow through the bike. Deeply chromed engine covers have curved upper surfaces. Their three-dimensional form adds volume and gives a quality appearance. The edges of the fins receive a special NC treatment that makes them gleam in sunlight. All the non-chromed parts of the engine have a matt black finish that further accentuates the chromed parts. Slim design of the belt drive contributes to appearance, especially on the VN1700 Classic. Ignition switch allows on-position key removal, preventing key bunches from damaging the instrument cluster or tank while the bike is in operation. Turning the ignition switch collar to the “OFF” position turns the engine off and necessitates re-insertion of the key to restart. Pushing the “S” switch to the left (“MODE-A”) toggles the lower display between “CLOCK”, “RANGE” (remaining cruising range) and “AVERAGE” (average fuel consumption). Pushing the “S” switch to the right (“MODE-B”) toggles the upper display from “ODO” to “TRIP-A” to “TRIP-B” and back. Kawasaki craftsmanship is also evident in the styling motif of the front fender. Motif from the front fender continues on the rear fender. The VN1700 is the first Kawasaki Cruiser to feature an elegant LED taillight. Rake / trail 30° / 6.7 in. Front Suspension / wheel travel 43mm hydraulic fork / 5.5 in. *Note: Specifications and pricing are subject to change.